We are big K’Nex fans in this house. A couple of years ago Genghis got his very first set. It was actually handed down to him from a friend whose son had played with them when he was little. The son is now in his 20’s, out of college and working full time. Anything that challenges Genghis and allows him to actually build something and he is all for it. I admit at times even being very surprised at some of the more advanced pieces he would build without asking for any help. 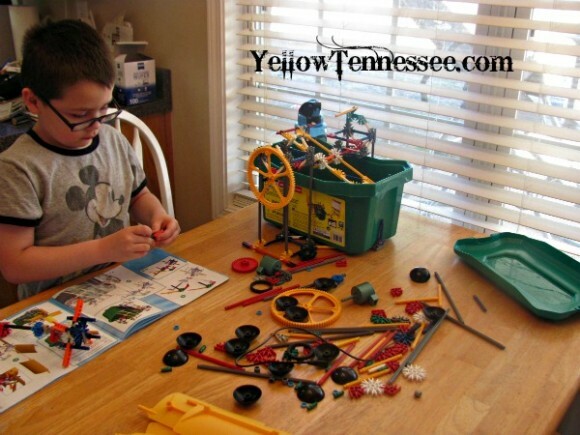 So when I was asked to review the K’Nex Education Sets, I was so excited about it. Being a home school mom I am always looking for things that are not only fun but also can be used as a teaching method. These K’Nex sets fit the bill perfectly. retail $64.99. Available October 1st on knex.com and at select online toy retailers. This has been one of my favorite sets. It has pieces and instructions to build up to 6 different sets and a solar board so that you can see the designs come to life. K’NEX Education: Simple and Compound Machines. Hands-On Learning! The K’NEX(r) Education Simple and Compound Machines Building Set is designed to expand upon middle school student’s knowledge of simple machines concepts. Students investigate, explore and experiment with the K’NEX(r) simple machine models as they analyze, synthesize, and evaluate information. The Teacher’s guide includes Student Inquiry Sheets and Worksheets for the models highlighted. Student Worksheets ask questions about the machine being investigated and present challenges that can be used to help students think more deeply about the concepts involved. Set includes 352 K’NEX(r) parts – enough to build 16 fully-functioning replicas of real-world machines, one at a time! Supports 1-2 students. Grades 5 – 9. Building instructions and comprehensive teacher’s guide aligned to Science, Technology, Engineering and Math Standards included. Packaged in a strong storage tub with snap-on lid. Suggested retail $59.99. Available October 1st on knex.com and at select online toy retailers. Using this set we were able to build everything from simple tools like a hammer and screwdriver, to more complex things like an elevator and even a scale. And every set really challenges Genghis. K’NEX Education: Force and Newton’s Laws. Off to the races with K’NEX(r) Education! The K’NEX(r) Forces and Newton’s Laws Building Set has been designed for students to investigate a variety of concepts related to forces, energy, and motion. These concepts are fashioned around rigorous STEM content and national standards in science, technology, engineering and math. As students engage in the activities, they will be learning, practicing, and applying integrated process skills. Students will be expected to craft fair test procedures, create meaningful data displays, make reasonable and data supported reports, and analyze their collected data in light of the problem at hand. These are just some of the process skills that students must employ as they use the K’NEX(r) Education Forces, Energy, and Motion Set. Set includes 115 K’NEX(r) parts, along with a Battery, Spring and Fly-wheel motor – enough to build 11 vehicles, one at a time. Supports 1-2 students. Grades 5 – 9. Building instructions and comprehensive teacher’s guide aligned to Science, Technology, Engineering and Math Standards included. Packaged in a strong storage tub with snap-on lid. Suggested retail $59.99. Available October 1st on knex.com and at select online toy retailers. This is the only set we haven’t used yet. We are getting ready to start learning about gravity next week in our science lessons and this will be a great aid to go along with the lessons. I am excited to give this one a try. 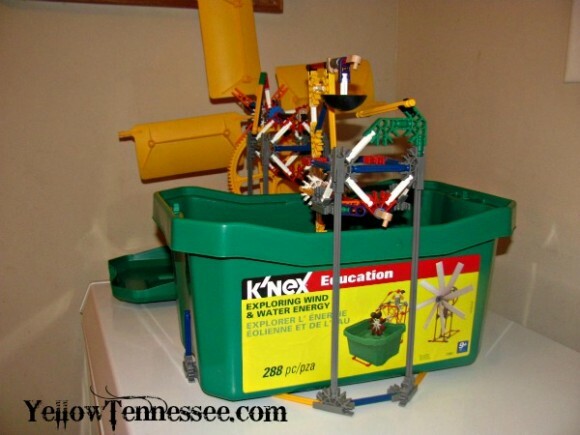 K’NEX Education: Exploring Wind and Water Energy. retail $69.99. Available October 1st on knex.com and at select online toy retailers. This has been the set we have used most recently. We are currently studying and talking about matter and physical and chemical changes. And while this set doesn’t focus on either of those it was a good way to tie in the fact that wind is matter, and talk about the different properties while also creating something that allowed for some hands on and visual examples. Today we created a wind powered water mill. I just wish we still had those 20 mile an hour winds to test it out in. My favorite thing about each of these sets is that they all come with a teaching guide. This gives me very practical ways to use each set to talk about different things. Each guide includes objectives, activities, key concepts, journals and worksheets. And not only does it help to guide discussions but it also gives you everything you need to be able to asses the students and make sure they are understanding all the material. Being part of the STEM program, each of these sets focuses on Science, Technology, Engineering, and Math. Honestly, as a homeschooling mom, these sets are like a dream come true. But I can also see the benefits for any children who are not only interested in science and technology but also those who need a little more hands on help to understand different concepts. The K’Nex Education sets perfectly cater to students needing to be challenged a little more and students needing some extra visual work to understand ideas, all with one box! 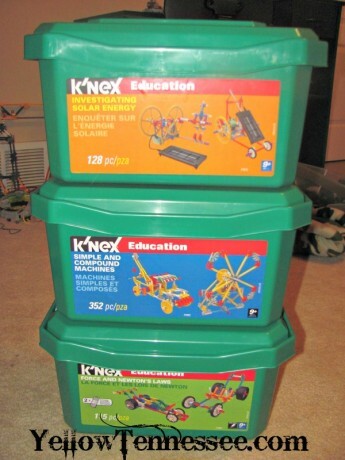 Have you tried any of the K’Nex Education Sets? You can keep up with all things K’Nex by liking the K’Nex Facebook Page.